Whether you are an existing or new startup hostel you will at some point need beds or bunk beds. There are quite literally thousands of outlets that will sell you beds and bunk beds yet only a handful that will provide your hostel with the right equipment. ESS Universal was set up way back by former travelers who have real travelling experience and have actually slept on a hostel bunk bed! Combining travel experience with engineering skills, ESS has developed the ideal solution for a hostel setup. Many of us have experienced hostels that have bunk beds and mattresses that are squeaky, uncomfortable, bent safety rails if any safety rails at all and ladders that start off a nightmare before you even sleep. Bedbugs waiting to feast, yes we have seen it all from Miami Florida to the far off reaches of northern Queensland Australia and it isn’t funny! 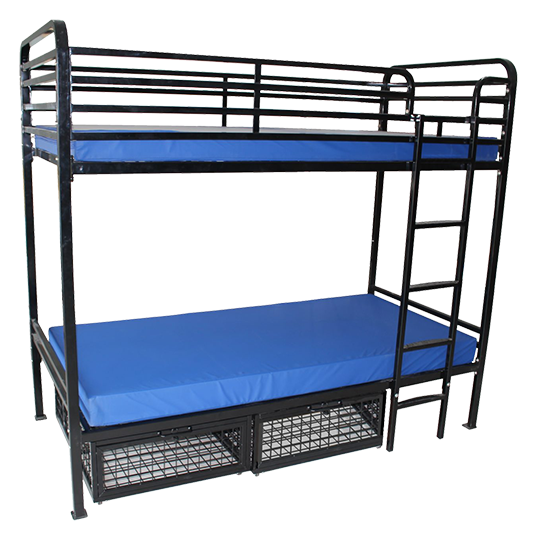 With bed and bunk bed frames our engineering experience was adopted to design for commercial strength, therefore rectangle and square metal tubing was adopted over a round tube. Round tubing is used by domestic manufacturers for cheapness and little Johnnies bedroom which is not appropriate for a commercial hostel situation. Every ESS bed and bunkbed is welded robotically creating a continuous seam weld on every single joint, this is unique to ESS Universal and does two things; prevents nesting insects and bed bugs out of the tubing system and adds to the overall strength of the frame. THE DALLAS D2 FROM ESS UNIVERSAL BED BUG RESISTANT MATTRESSES – DO IT ONCE, DO IT RIGHT! Bed bugs are nocturnal creatures that like to hide in warm dark places, ESS Universal set out to battle these little critters by cutting off their hiding places. The ESS Universal M1 mattress range has no seams or hem on its water resistant, anti-bacterial cover. This amazing hostel mattress eliminates the possibility of having to discard such a valuable asset should your hostel ever suffer a bed bug infestation. The ‘easy inspect’ mattress has a removable zipped cover that can be machine washed on high temperature killing any bed bug, then simply refit; this is truly a hostel valuable asset by any means. The ESS Universal foam core mattress is being used by some of the largest and most popular hostels around the globe and been in use over 5 years; this is a mattress you need to invest into.